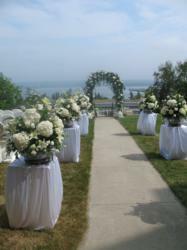 Digby Pines Nova Scotia Resort offers new Nova Scotia Wedding Packages perfect for Maritime Weddings. Flower gardens, spacious lawns and woodland trails add to the charm of this summer resort and make a perfect backdrop for your wedding photos. Digby Pines Nova Scotia Resort launches new Maritime Wedding Guide complete with catering menus, location details, and much more. Located in the scenic town of Digby, Nova Scotia overlooking the Annapolis Basin, Digby Pines offers breath taking grounds perfect for a Nova Scotia wedding. Digby Pines new Maritime Wedding package is complete with services from head to two to provide the bride and groom with a stress free Nova Scotia wedding. The 2012 wedding guide is a detailed document showing prices, frequently asked questions, possible wedding locations around the resort, entertainment options, food selections and every little detail a bride and groom would need for their special day. The Digby Pines offers many affordable Nova Scotia packages. As part of the Nova Scotia wedding package, the bride and groom are invited to come back and celebrate their first anniversary with the Nova Scotia resort. The newlyweds enjoy a complimentary one night accommodations and dinner for two to reminisce about their unforgettable wedding experiences they had with Digby Pines. For more information, questions or would like to further details on planning a wedding at the Nova Scotia Golf Resort, please contact the Digby Pines. Experience the world of casual elegance at Digby Pines Golf Resort and Spa, welcoming guests to this Norman - Style Chateau overlooking the beautiful Bay of Fundy since 1929. The resort features the best of Nova Scotia accommodations with 147 total guestrooms, including 85 well appointed rooms and suites in the main chateau. For a more intimate, secluded setting choose from among the 31 one, two and three bedroom Maritime cottages nestled around the spacious grounds. Each has its own cozy living room with a fireplace and veranda. Complimentary wireless internet is available in the Grande Lounge and meeting rooms. Digby Pines is pleased to offer a smoke-free environment.